To Cite: Janahi E M, Al-Mannai M, Singh H, Jahromi M M. Distribution of Hepatitis C Virus Genotypes in Bahrain, Hepat Mon. 2015 ; 15(12):e30300. doi: 10.5812/hepatmon.30300. Background: Approximately 170 million people are infected with Hepatitis C virus (HCV) worldwide, making it one of the world’s major infectious diseases. There are no published population based studies about the prevalence of HCV genotypes in Bahrain. Objectives: Therefore, the aim of the present study was to investigate the prevalence and distribution of HCV genotypes and subtypes among a large sample of patients with chronic HCV infection in Bahrain. Patients and Methods: Serum samples were collected from 202 HCV positive patients; of them 128 had a viral load (> 500 IU/mL) suitable for the type-specific genotyping assay. Gender-wise and age-wise differences in the distribution of HCV genotypes were determined by Chi Square and Fisher’s Exact tests. Results: The predominant genotype among Bahraini patients was type 1 (36.71%), followed by genotypes 3 and 4 (15.6% each) and the lowest frequency was found for genotype 2 (3.9%). Among genotype 1, subtype 1b had the highest frequency (21.09%), followed by subtype 1a (14.06%). Among genotype 3, subtype 3a had the highest frequency (11.72%), while among genotype 4, most of subtypes were undetermined. The frequency of all different HCV genotypes was higher in male patients compared to female patients. Genotype 1 was most common in the age group of 51 - 60 years (38.3%), genotype 2 in 21 - 30 years (60%) and genotype 3 in 51 - 60 years (30%), while genotype 4 was most frequent among the age group > 61 (40%). Conclusions: The most common HCV genotype in Bahrain was subtype 1b followed by 1a and 3a. Further studies involving sources of transmission in Bahrain are required to enhance control measures for HCV infection. Hepatitis C virus (HCV) is the causative agent of one of the world’s major infectious diseases with about 170 million infected individuals (1). Patients with chronic HCV frequently progress to liver cirrhosis, which put them at higher risk of developing hepatocellular carcinoma (2). The prevalence of HCV infection worldwide ranges from 0.2% up to 40% (about 0.2% to 2.2% in developed countries and nearly 7% in developing countries) (3-5). The Middle East countries are known to have very high prevalence of HCV infection as one of the highest prevalence of the disease (18.1%) has been reported from Egypt (6). The mortality rate of HCV infection is very high and nearly 350,000 people die annually. The currently available therapy is limited by patients’ toxicity, viral resistance and high cost of treatment. To date, no vaccine is available (7). HCV genome shows remarkable heterogeneity. There are seven main genotypes (termed 1 to 7), which are subdivide into over 67 different subtypes (termed a, b, c, etc.) (8, 9). HCV genotypes 1, 2 and 3 seem to have a global distribution with variable relative prevalence from one geographic region to another. Other genotypes have a more restricted geographical distribution, for example genotype 4 is found in the Middle East and Africa, genotype 5 in South Africa and genotype 6 in Southeast Asia (10, 11). Genotype 1 is the dominant genotype in Jordan (12), Iran (13, 14), Turkey (15) and Israel (16), while genotype 4 is the dominant genotype in Iraq (17), Saudi Arabia (18), Kuwait (14) and Yemen (19). HCV genotypes differ at the nucleotide level from each other by 30% to 33%, while subtypes differ by 20% to 25% (14). The major subtype in Japan is subtype 1b, which accounts for up to 73 % of HCV cases (20). HCV subtypes 2a and 2b are widespread in North America, Europe and Japan, while subtype 2c is relatively common in northern Italy (21). Subtype 3a, which is very common among intravenous drug abusers, is found mainly in Europe, the USA and South East Asia (21). Investigators are arguing about the classification and actual number of HCV genotypes. Some suggested that genotypes 7 to 11 should be considered as variants of genotype 6 (22, 23), especially that genotypes 7, 8 and 9 have been isolated only from Vietnamese patients (24), while genotypes 10 and 11 were isolated from Indonesian patients (25). One of the important factors in predicting the prognosis of HCV infection is viral genotype/subtype (26). It seems different genotypes are associated with varied severity of liver damage and different responses to antiviral treatment (14). Primary data about HCV in any country would provide significant information to program managers and health planers to control and manage the infection with reference to its etiological spectrum. In general, there are few published data about the prevalence of HCV genotypes in the Persian Gulf Area, and in particular there are no published population based studies about the prevalence of HCV genotypes in Bahrain. Therefore, the aim of the present study was to investigate the distribution of HCV genotypes among a large sample of patients with chronic HCV infection in Kingdom of Bahrain. This baseline data would aid better understanding of infection in Bahrain, enhance the awareness of public and improve subsequent control and therapy strategies. All the serum samples were received along with patient’s data sheets from Salmaniya medical complex (SMC), the main and largest public hospital in Kingdom of Bahrain, which receives all HCV positive samples from all 21 primary health care centers in Bahrain. During this cross-sectional study period, a total of 202 HCV positive patients were enrolled. The number of HCV positive patients attending the hospital during the study period was 237 patients. Inclusion criteria were positive anti-HCV antibodies, positive plasma HCV RNA and not being treated previously for hepatitis C virus infection. Five milliliters of venous blood was collected from patients and sera were separated and stored at -80°C until tested for HCV genotyping. HCV RNA was extracted from 140 µL of serum using the QIAamp viral RNA Extraction kit (Qiagen, Germany) as per the manufacturer’s instructions. The Versant HCV amplification 2.0 kit (Siemens Medical Solutions Diagnostics, Germany) was used according to the manufacturer’s protocol to amplify the 5′UTR and the core regions of the HCV genome. Master mix was prepared using the supplied ENZ MIX with reverse transcriptase, HotStartTaq polymerase, UNG and the AMP MIX with 2 pairs of biotinylated primers, deoxynucleoside triphosphates, deoxyuridine triphosphates, magnesium chloride and RNAsin. Reactions were run in individual tubes containing 30 μL of master mix and 20 μL of the extracted RNA. The initial 10-minute room temperature incubation allowed degradation of contaminating DNA containing uracil. RT-PCR was performed as follows; (50°C for 30 minutes, 95°C for 15 minutes, 40 cycles [95°C for 30 seconds, 50°C for 30 seconds, 72°C for 15 seconds], 55 cycles [90°C for 20 seconds, 65°C for l0 seconds, 72°C for l0 seconds], 72 °C for 5 minutes, 72°C for 2 minutes). The size of the PCR fragments was 240 bp of the 5’UTR and 270 bp of the core region. Detection of HCV genotypes/subtypes was performed using Versant HCV genotype assay kit (LiPA) 2.0 (Siemens Medical Solutions Diagnostics, Germany). This kit is a reverse hybridization line probe assay designed to identify HCV genotypes 1 to 6 in the 5′UTRs and core regions of HCV genome. The probes are bound to a nitrocellulose strip by a poly (T) tail. After hybridization of the biotinylated PCR products to the probes, unhybridized PCR products were washed from the strips. Next, alkaline phosphatase-labeled streptavidin (conjugate) was added to the biotinylated hybrid. After washing the strips, 5-bromo-4-chloro-3-indolylphosphate-nitroblue tetrazolium chromogen (substrate) was added, which forms a purple/brown precipitate in the form of a visible line pattern on the strip specific for each genotype. Each strip has 3 control lines and 22 probe lines specific for HCV genotypes 1 to 6. HCV genotypes are determined by aligning the strips with a reading card and comparing the line patterns from the strip with the patterns on the interpretation chart (27). Some variables were presented in percentage (%). Associations between categorical variables were measured using Chi Square and Fisher’s Exact tests. SPSS version 20 (SPSS Inc., USA) was used for data analysis and P values of 0.05 or less were considered significant. This research project was approved by both the scientific research committee at the college of science as well as the deanship of scientific research, university of Bahrain. Of 237 Bahraini HCV positive patients recorded in Bahrain during the study period, 202 patients were included in this study; of them only 128 patients had a viral load (> 500 IU/mL) suitable for the genotyping assay, while the rest were excluded because of low viral load (< 500 IU/mL). Therefore, the sample size represents 54% of the total number of HCV positive patients in Bahrain during the study period. Of 128 patients, 91 (71.1%) were male. All patients were Bahraini citizens. The prevalence of HCV infection showed an increase with age, as the highest incidence was shown for the age group 51 - 60 (P < 0.001). The age group with the lowest prevalence was 0 - 20. Chi-square test showed significant differences between the age groups using the first group (0 - 20) as a reference (χ2 = 71.25, P < 0.001). The mean age of patients was 48.3 ± 12.4 years (ranged 17 - 74). The average age of males was significantly higher than that of females (P < 0.001). The percentage of male positive samples was higher in age group 51 - 60 years, while most female positive samples were in the age group 41 - 50 years (P < 0.05). 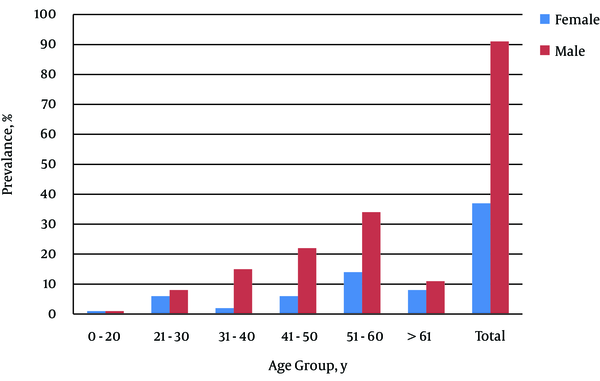 Figure 1 shows the prevalence in different age groups and gender. Table 1 shows the results of HCV genotyping among the studied group. Of 128 tested serum samples, type-specific PCR fragments were observed in 92 (71.87%) serum samples. The dominant genotype among Bahraini patients was type 1 (36.71%), followed by genotypes 3 and 4 (15.6% each) and the lowest frequency was found for genotype 2 (3.9%). Among genotype 1, subtype 1b had the highest frequency (21.09%), followed by subtype 1a (14.06%). Among genotype 3, subtype 3a had the highest frequency (11.72%), while among genotype 4, most subtypes were undetermined. Thirty six (28.13%) serum samples were found undetermined by the present genotyping assay. Mixed HCV subtypes were observed in 3.9% of the study population. Of mixed subtype infections, subtypes 2a and 2c were the most common (80%). The only mixed infection with three HCV subtypes (4a, 4c and 4d) was detected in 0.78% of the patients (Table 1). bThese samples could of new subtypes. cThe genotyping assay recognizes only genotypes 1 to 4, so these samples could be of other genotypes. The frequency of all different HCV genotypes was higher in male patients compared to females (Table 2). This was in comparison to the number of HCV infected male and female individuals in the total population, since the proportion of infected male was 0.0512% of the total male population, while the infected female proportion was 0.0196%. The exception for that was the mixed HCV subtypes as it was higher in female patients (3.9%) compared to male. Genotype 1 was more common among both male (37.4%) and female (35.1%) patients. The least common genotype among male patients was 2 (1.1%), while genotype 3 had the lowest frequency (5.4%) among female patients. The frequency of undetermined genotypes were 28.6% and 27% in male and female patients, respectively. Subtype 1b was more frequent in both male (22%) and female (18.9%) patients, while subtypes 2b and 4h were the least common among both male and female patients. There was a statistically significant difference in the distribution of genotypes between males and females (P < 0.05). Table 3 shows the frequency of HCV genotypes between different age groups. Genotype 1 was most common in the age group of 51 - 60 years (38.3%), genotype 2 in the age group 21 - 30 (60%) and genotype 3 in the age group 51 - 60 (30%), while genotype 4 was most frequent in the age group > 61 (40%). Among all genotypes, the lowest frequency was seen for the age group 10 - 20 years. Subtypes 1a and 1b were more common in patients of the age group 51 - 60 (44.4% and 37%), while subtypes 3a and 3b were most frequent in patients of the age groups 41 - 50 and 51 - 60, respectively (26.6% and 50%). The frequencies of the genotype 4 subtypes were higher in patients over 41 years of age; however, most of the samples belonging to this genotype were of undetermined subtype (85%). The mixed subtypes 2a and 2c were only observed in the age groups 21 - 30 and 41 - 50, while the mixed subtypes 4a, 4c and 4d were only observed in patients above 61 years old. The highest frequency of undetermined genotypes was seen in the age group 51 - 60 (47.2%), while the lowest frequency was in the age group 10 - 20 (0.03%). Data obtained from mass screening of populations for HCV genotypes provides significant information to program managers and health planners to control and manage HCV infection. Besides, it plays a crucial rule in assessing therapeutic decisions and approaches (26, 28, 29). As it has been shown that the severity, prognosis of disease and response to therapy may vary according to the genotype (30, 31). The present study was the first investigation of the frequency of HCV genotypes conducted at the population level in kingdom of Bahrain, which may contribute positively to refinement of HCV prevention and therapeutic programs. The sample size was an excellent representation for HCV population in Bahrain as 128 patients were included in this study of 237 Bahraini HCV patients recorded in Bahrain during the study period; therefore, the sample size represents 54% of the total number of HCV positive patients in Bahrain. The overall prevalence of HCV in Bahrain during the study period was 0.99% (32). HCV prevalence among male patients was 71.1%, while it was 28.9% among females. This higher prevalence among males may reflect risk factors related to male activities. Besides, the average age of males was higher than that of females, which may explain the different prevalence. The prevalence of HCV infection showed an increase with age, as the highest incidence was shown for the age group 51 - 60, which is explained by increased exposure with age. The dominant genotype in our study was genotype 1 with 36.71% frequency, which is similar to some countries in the Middle East like Jordan (73.3%) (12), Iran (56.2%) (13, 14), Turkey (87%) (15) and Israel (> 70%) (16). However, geographically closer countries like Iraq (17), Saudi Arabia (18) Kuwait (14) and Yemen (19) had different dominant genotype, which was genotype 4. This might be attributed to different factors, including the presence of workers from countries known to have HCV genotype 1 as the dominant genotype like Jordan (12) and Baluchistan province in Pakistan (1). These individuals may have donated blood used among Bahrainis before the era of HCV testing. It has been shown that public health-care facilities in some of these countries use unsafe and potentially hazardous injections practices for therapeutic or immunization injections (33, 34). Furthermore, the use of multiple-dose vials is a common practice in these countries. Another interesting result of the study is the second dominant genotype, which were 4 and 3 (about 15% each). HCV genotype 4 is widespread in the Middle East and Central Africa. Genotype 4 has been linked with increased incidence of cirrhosis and poor response to interferon therapy (35, 36). This observation may reflect extensive immigration in the last few years from countries known to have genotype 4 as the main HCV genotype in their population like Egypt (37) and Syria (38). Furthermore, many Bahrainis travel to other countries like Egypt and India for medical treatment and might have acquired HCV from there. HCV genotype 4 is mainly prevalent in hemodialysis patients in Bahrain. Egypt is known to be one of the countries with the highest HCV prevalence (37), mainly due to reuse of syringes for medical treatment, particularly in rural areas of Egypt where schistosomiasis is endemic. This resulted in vertical transmission of the virus among large number of population before wide availability of oral medication. Moreover, schistosomiasis induces immunosuppression, which may enhance HCV infection. Two subtypes 2c and 3b were isolated for the first time in Bahrain. In the last decade, a shift in HCV genotype distribution has been reported in many countries, as an example an increase was seen in the prevalence of subtypes 3a, 1a, and genotype 4, and a decrease in subtype 1b and genotype 2 (39-41). The frequency of various HCV genotypes was significantly higher in male patients compared to females (P < 0.05). This was in comparison to the number of HCV infected male and female individuals among the total population, since the proportion of infected male was 0.0512% of the total male population, while the infected female proportion was 0.0196%. The results of our study showed that distribution of HCV genotypes varies with age, which has been shown in previous studies (42). Subtypes 1a and 1b were more common among older patients (51 - 60 years old), whereas subtype 3b was the most common subtype among younger individuals (10 - 20 years old). Similar results were found by several recent studies, which indicate an increase in the frequency of HCV genotype 3 among younger population of Iran (14), Germany (41), Serbia and Montenegro (43) and Slovenia (44). Some epidemiological studies suggested that different types of HCV might be correlated with discrete transmission routes. For example, in Pakistan genotype 3a is associated with multiple injections through contaminated needles (1). Furthermore, it has been shown that HCV genotype 3a is most common among intravenous drug abusers in Europe and the United States (45-47). In this study, the most common subtypes were 1a and 1b and according to several studies the most probable cause of transmission observed with these subtypes were major/minor surgeries and dental procedures (1). However, in some studies, most patients with genotype 1 were infected through receiving blood transfusions (47-49). The high frequency of subtype 3b in younger patients suggests an increase in IVDU as the main route of HCV transmission among them (50). Mixed HCV subtypes were observed in 3.9% of the study population, which is common among patients who received multiple blood transfusions like patients with thalassemia and Sickle cell disease, which is a common disease in Bahrain (1, 51). Several studies indicated that infection with a specific HCV genotype does not create a barrier to infection with other HCV genotypes, thus several exposures to HCV might lead to mixed infections in some patients (50). The mixed subtypes 4a, 4c and 4d were only observed in patients above 61, which is explained by increased exposure with age. This may result in poor prognosis and poor response to antiviral therapy or relapse following antiviral treatment (52, 53). The overall prevalence of HCV in Bahrain during the study period was 0.99% (32). HCV prevalence among male patients was 71.1%, while it was 28.9% among females. The dominant HCV genotype in Bahrain was 1 followed by 3 and 4. Among genotype 1, the dominant subtypes were 1a and 1b. Two subtypes 2c and 3b were isolated for the first time in Bahrain. The advantage of this study was its large sample size, which helped to draw a good estimate of HCV genotype distribution in Bahrain. However, the low number of HCV infected children and young adults did not give us a precise estimation of HCV genotypes among young age group. The authors wish to thank all who participated in this study and also to thank all primary health care centers and SMC for collecting clinical samples. The authors would like also to thank UOB for their generous support. Finally, it is our pleasure to acknowledge with gratitude the financial support of ‘‘TECHNOCHEM TRADING’’ to cover the publication fees, and my sincere thanks and appreciation is extended to its president Mr. Mark Anthony T. Napule for his generous support. Authors’ Contribution: Essam Janahi and Mohamed M. Jahromi performed the experiments. Data Entry: Essam Janahi and Hemlata Singh; statistical analysis: Essam Janahi and Mariam Al-Mannai; analyzed the data: Essam Janahi; wrote the paper: Hemlata Singh and Essam Janahi. Hemlata Singh: visiting scientists. Funding/Support: This project was partially funded/supported by university of Bahrain, deanship of scientific research and ministry of health, Kingdom of Bahrain.